Al-‘Uzzá (Arabic: العزى‎‎ al-ʻUzzá [al ʕuzzaː]) was one of the three chief goddesses of Arabian religion in pre-Islamic times and was worshiped by the pre-Islamic Arabs along with Allāt and Manāt. The Nabataeans equated her with the Greek goddess Aphrodite Ourania (Roman Venus Caelestis). A stone cube at aṭ-Ṭā’if (near Mecca) was held sacred as part of her cult. She is mentioned in the Qur'an Sura 53:19 as being one of the goddesses that people worshiped. Al-‘Uzzá, like Hubal, was called upon for protection by the pre-Islamic Quraysh. "In 624 at the 'battle called Uhud', the war cry of the Qurayshites was, "O people of Uzzā, people of Hubal!" Al-‘Uzzá also later appears in Ibn Ishaq's account of the alleged Satanic Verses. The temple dedicated to al-‘Uzzá and the statue itself was destroyed by Khalid ibn al Walid in Nakhla in 630 AD. Shortly after the Conquest of Mecca, Muhammad began aiming at eliminating the last idols reminiscent of pre-Islamic practices. He sent Khalid ibn Al-Walid during Ramadan 630 AD (8 AH) to a place called Nakhlah, where the goddess al-‘Uzzá was worshipped by the tribes of Quraish and Kinanah. The shrine's custodians were from Banu Shaiban. 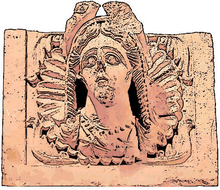 Al-‘Uzzá was considered the most important goddess in the region. Khalid set out with 30 horsemen to destroy the shrine. It appears that there were two idols of al-‘Uzzá, one real and one fake. Khalid first located the fake and destroyed it, then returned to the Prophet to report that he had fulfilled his mission. "Did you see anything unusual?" asked the Prophet. "No," replied Khalid. "Then you have not destroyed al-‘Uzzá," said the Prophet. "Go again." Angry at the mistake that he had made, Khalid once again rode to Nakhla, and this time he found the real temple of al-‘Uzzá. The custodian of the temple of al-‘Uzzá had fled for his life, but before forsaking his goddess he had hung a sword around her neck in the hope that she might be able to defend herself. As Khalid entered the temple, he was faced by an unusual naked dark woman who stood in his way and wailed. Khalid did not stop to decide whether this woman might be there to seduce him or to protect the idol, so he drew his sword in the name of Allah and with one powerful stroke the woman was cut in two. He then smashed the idol, and returning to Mecca, gave the Prophet an account of what he had seen and done. Then the Prophet said, "Yes, that was al-‘Uzzá; and never again shall she be worshiped in your land." Over her [an Arab] built a house called Buss in which the people used to receive oracular communications. The Arabs as well as the Quraysh were wont to name their children "‘Abdu l-‘Uzzá". Furthermore, al-‘Uzzá was the greatest idol among the Quraysh. They used to journey to her, offer gifts unto her, and seek her favours through sacrifice. This last phrase is said to be the source of the alleged Satanic Verses; the Arabic term is translated as "most exalted females" by Faris in the Book of Idols, but he annotates this much-argued term in a footnote as "lit. Numidean cranes." ‘Abdu l-‘Uzzá ["Slave of the Mightiest One"] was a favourite proper name during the advent of Islam. The name al-‘Uzzá appears as an emblem of beauty in late pagan Arabic poetry quoted by Ibn al-Kalbī, and oaths were sworn by her. Susan Krone suggests that the identities of al-‘Uzzá and al-Lāt were fused in central Arabia uniquely. On the authority of ‘Abdu l-Lāh ibn ‘Abbās, at-Tabari derived al-‘Uzzá from al-‘Azīz "the Mighty", one of the 99 "beautiful names of Allah" in his commentary on Qur'an 7:180. According to Easton's Bible Dictionary, Uzza was a garden in which Manasseh and Amon were buried (2 Kings 21:18, 26). It was probably near the king's palace in Jerusalem, or may have formed part of the palace grounds. Manasseh may probably have acquired it from someone of this name. Another view is that these kings were culpable of idolatry and drew the attention of Ezekiel. In Judaic and Christian lore, Uzza has been also used as an alternative name for the angel Metatron in the Sefer ha-heshek. More commonly he is referred to as either the seraph Semyaza or as one of the three guardian angels of Egypt (Rahab, Mastema, and Duma) that harried the Jews during the Exodus. As Semyaza in legend he is the seraph tempted by Ishtahar into revealing the explicit name of God and was thus burned alive and hung head down between heaven and earth as the constellation Orion. In the 3rd book of Enoch and in the Zohar he is one of the fallen angels punished for cohabiting with human women and fathering the anakim. ‘Uzzā is also identified with Abezi Thibod ("father devoid of counsel") who in early Jewish lore is also used as another name for Samael and Mastema referring to a powerful spirit who shared princedom of Egypt with Rahab and opposed Moses to eventually drown in the Red Sea. ↑ Ibn Ishaq Sirat Rasul Allah, pp. 165-167. 1 2 The sealed nectar, By S.R. Al-Mubarakpuri, Pg256. Books.google.co.uk. Retrieved 2013-02-03. ↑ Ibn al-Kalbi, trans. Faris (1952), pp. 16–23. ↑ Hitti (1937), pp. 96–101. ↑ Krone, Susan (1992). Die altarabische Gottheit al-Lat Cited in Arabic Theology, Arabic Philosophy: From the Many to the One. Berlin: Speyer & Peters GmbH. p. 96. ISBN 9783631450925. ↑ Ibn al-Kalbi, Book of Idols, 25. ↑ Davidson (1967), pp. xiii, xxiv. ↑ Davidson (1967), p. 301. ↑ Davidson (1967), pp. 18, 65. ↑ Davidson (1967), p. 4. Ambros, Arne A. (2004). A Concise Dictionary of Koranic Arabic. Wiesbaden: Reichert Verlag. ISBN 3-89500-400-6. Burton, John (1977). The Collection of the Qur'an (the collection and composition of the Qu'ran in the lifetime of Muhammad). Cambridge University Press. Davidson, Gustav (1967). A Dictionary of Angels: Including the Fallen Angels. Scrollhouse. ISBN 0-02-907052-X. Finegan, Jack (1952). The Archeology of World Religions. Princeton University Press. pp. 482–485, 492. Hitti, Philip K. (1937). History Of The Arabs. Ibn al-Kalbī, Hisham (1952). The Book of Idols, Being a Translation from the Arabic of the Kitāb al-Asnām. Translation and commentary by Nabih Amin Faris. Princeton University Press. LCCN 52006741. Peters, F. E. (1994). The Hajj: The Muslim Pilgrimage to Mecca and the Holy Places. Princeton University Press. al-Tawil, Hashim (1993). Early Arab Icons: Literary and Archaeological Evidence for the Cult of Religious Images in Pre-Islamic Arabia (PhD thesis). University of Iowa. Wikimedia Commons has media related to Al-Uzza.